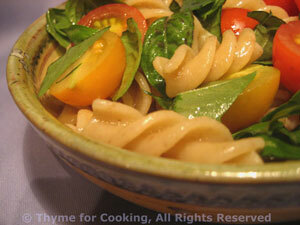 Simple Pasta Salad, Thyme for Cooking easy summer side dish. Rinse lightly and drain again. Snip large basil leaves, keeping small leaves whole. Put mustard, vinegar and oil in a large salad bowl. Whisk together. Add pasta, tomatoes and basil. Stir well to coat. Serve.